Yesterday I accidentally flicked a switch on our eCommerce store that caused Poked Copilot to be free. If you tried to buy Poker Copilot from on online store yesterday you received a 100% discount. Giving all customers a 100% discount is not a good business practice. Fortunately only a couple of people “bought” Poker Copilot before I realised what was happening. You can now download an early access update of Poker Copilot with a working Zoom Poker HUD. Download now. This is under development still, so expect possible problems. It works on one table at a time, on No Limit Hold’em, with real money. 2. (Optional) If you want your already-played Zoom hands to be included in the HUD statistics, select “Tools” -> “Recalculate Statistics” and wait for it to finish. 3. Open PokerStars, and sit down at a Zoom Poker table. 4. Maximise the Zoom Poker table. If your monitor doesn’t have at least 1600 x 900 resolution, you won’t be able to make the window big enough. Sorry. I do intend to make Zoom Poker work at smaller window sizes eventually. 5. 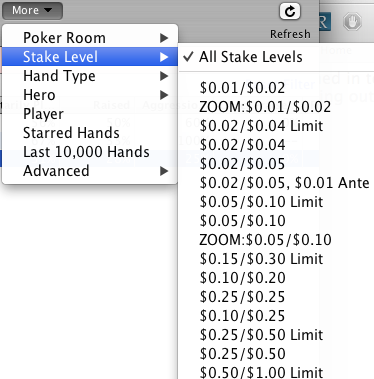 Make sure you’ve selected one of PokerStars’ “Nova” table themes. The first column is the seat number, starting from the upper-left hand seat and continuing clockwise. 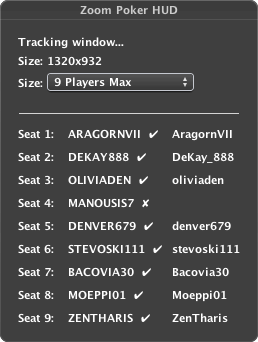 The second column is Poker Copilot’s “normalised” name for each player, determine by screen-scraping. It is all caps, with spaces and punctuation removed, and letters with umlauts and other diacritical marks converted to their closest plain latin alphabet equivalent. 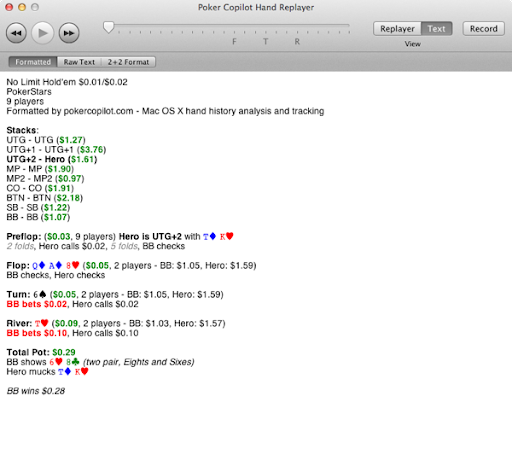 The third column is the matched name in Poker Copilot’s database, if any. If a match is found, then you’ll also see a “tick” symbol or checkmark. The tick means that Poker Copilot is showing statistics on that player. The matching uses fuzzy logic, so that “Poker Copilot” will match “Poker Oopilot” and “Pker Copilot”. This allows for the difficult of 100% success with screen scraping. This contains the scraped images from the most recent session. It is deleted and started anew when you restart Poker Copilot. Find the image in there for the player that Poker Copilot didn’t scrape successfully and email it to me at steve@pokercopilot.com. Likewise, the HUD will not mix Zoom Poker stats with regular Poker stats. Like the subject says. 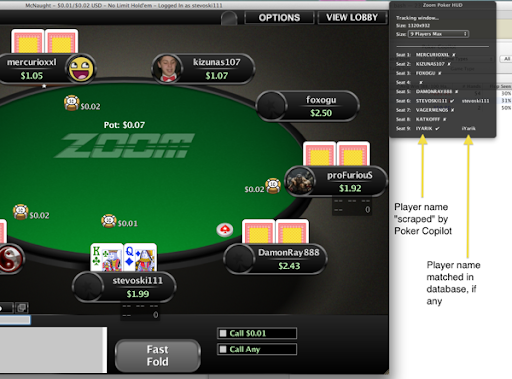 Last last night I played 100 hands or so of Zoom Poker with the new Poker Copilot Zoom Poker HUD. It was recognising an increasing number of people successfully, so that eventually I was seeing statistics on most players. Now for some tidying up, further OCR “teaching”, and then I can release a early-access version. The Absurdity of Modern Life: Facebook claims trademark on "Book"
I’ve got the basics working. 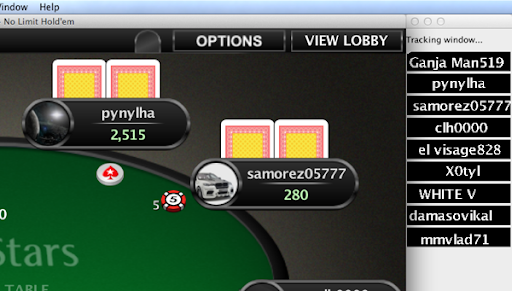 When I play Zoom Poker, Poker Copilot promptly identifies about 50% of the players correctly. The basic components are in place, but all need to be improved, tightened up, and tidied up. The biggest problem is the letter k – I’ll need to tune my code to handle this better. My ScreenScraping Teaching tool I’m using to create the Poker Copilot Zoom Poker HUD shows an image on screen and what character it thinks that image contains. I tell the Teaching tool if the character is correct or not. Problem is, I can’t tell whether it thinks an image is an upper case 0 or the number 0. I can’t tell if it thinks a letter is an upper case i (l) or a lower case L (l). Now that’s going to be hard to determine purely via naïve screen scraping. Wish me luck. On Sunday PokerStars released Zoom Poker. It seems to be equivalent to the late Full Tilt Poker’s Rush Poker. I’m having a go at making a working HUD for Zoom Poker. Fortunately I went a long way down this path for an experimental Rush Poker HUD back in the day. So a lot of my necessary learning is already done, as is a semi-working solution. Every hand in Zoom Poker is with a different set of opponents, so Poker Copilot’s approach of determining who is at the table from the hand history after a hand does’t work here. After ruling out other possible approaches, it seems clear to me that I need to use screen scraping. To make the problem easier to solve, I’m setting some strict constraints at first: 9-player tables, using any of the “Nova” table themes, on one table, with the table made as big as PokerStars allows (1320 pixels by 932 pixels). Once I get that working satisfactorily here in the lab, I’ll make it available for eager testers, to weed out problems. Then once that is working, I can look at removing the constraints one at a time. After two days’ work, I’ve got parts of the solution in place. In the following screenshot you can see some of the workings: in real-time, Poker Copilot is grabbing the player names in image form, then converting each image to a binary image via a technique called thresholding. A further process trims each binary image, then separates the image into free-standing images of individual characters as much as possible. I intend to build up up a repository of as many images as possible so that I can “teach” Poker Copilot which image is equivalent to which character (or characters). Here’s a glimpse of the tool I created to “teach” Poker Copilot about the letters. You can see the whole player name, the individual letters, and the third column where I manually tell Poker Copilot which letter is represented.